Celebrate your wedding day with Paul’s Cheesecake. For couples looking beyond the traditional wedding cake, Paul’s Cheesecake offers the modern day alternative to a traditional wedding cake. Our single cheesecake is perfect for a small gathering or arrange up to five tiers for a larger affair. 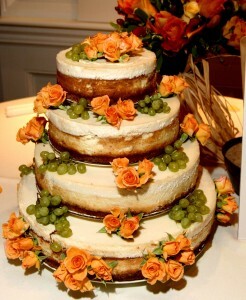 Your wedding cake can be decorated with flowers or fruit for a splash of color.